WE GUARANTEE YOUR GUESTS WILL LOVE OUR FOOD! There is NO minimum order for Bulk catering. We are not the cheapest but we are the BEST! We serve generous portions of meats and sides- you will have leftovers! We require a minimum of one week's notice for catering orders. Due to our small size we are unable to deliver catering orders- you must pick them up at our trailer. BULK CATERING- Create your own menu! All bulk catering comes in disposable aluminum half trays (10.5” x 13”). One half tray will serve 10-12 people. Rolls are not included with meat purchases. Large 4" bulky rolls are available for $1.00 each. Setups (sturdy paper plates, plastic utensils, napkins) available for $1 per person. Disposable chafing dish setups (one frame, one water pan, 2 sternos) available for $10 each. Each setup will hold two half trays. State and local taxes and gratuity not included in above pricing. All food is picked up freshly cooked, hot and ready to serve. A 50% non-refundable deposit is required one week prior to your event. Balance is due when food is delivered. Cash and credit/debit cards are accepted for payment. We do not accept checks. ​ALL PRICES SUBJECT TO CHANGE WITHOUT PRIOR NOTICE. Consuming raw or undercooked meat, poultry, or shellfish may increase your risk of foodbourne illness. Before placing your order, please inform the server if a person in your party has a food allergy. A word about GLUTEN- My spice suppliers will not tell me if their products contain gluten or not. Consequently, I must err on the side of caution and say that ALL OF OUR PRODUCTS CONTAIN GLUTEN EXCEPT THE CHICKEN. My chicken is GLUTEN-FREE, because I use no seasonings on it and rely on the smoke flavor alone. Consuming raw or undercooked meat, poultry, or shellfish may increase your risk of foodbourne illness. Y'all come see us now, ya hear? 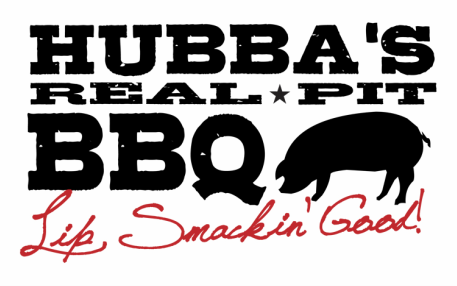 Hubba's Real Pit BBQ logo and website copyright 2016 Robert B Hudson. All rights reserved.